The original Pedego electric bike — with improvements that every Canadian can enjoy. The first thing you notice when you ride an Comfort Cruiser is how comfortable you feel. With its swept back handlebars and cushy seat, riding feels as gentle as a sea breeze. The Pedego Comfort Cruiser has style like no other electric bike. 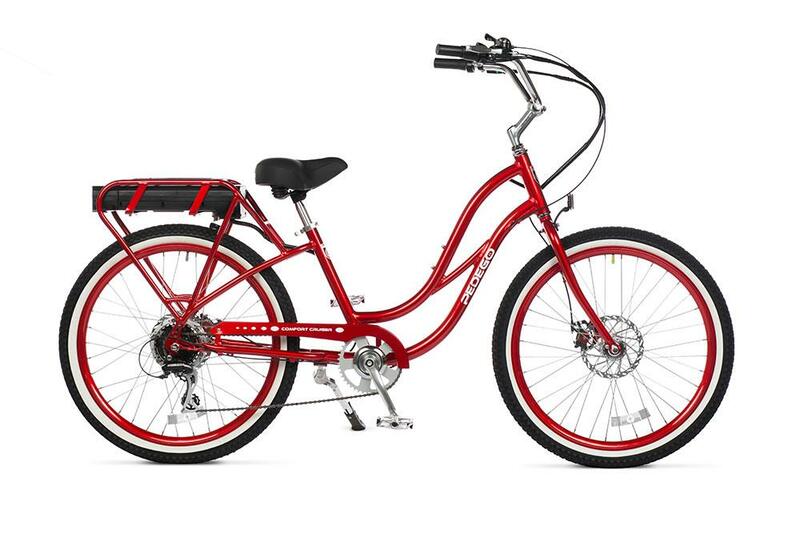 In coral with aqua rims, midnight blue or bright red, this bike embodies fun. A 36 Volt battery uses the same advanced lithium-ion cells as an electric car. It can travel up to 70 kilometres on 10 cents worth of electricity. At 500 watts, it has one of the most powerful motors for accelerating and climbing steep hills. The thrill of riding at the touch of a throttle. Pedego Electric Bikes have been done well for more than a decade. I love to do business with a company that loves their business! I really love to do business with a company that loves their business, and Pedego is just such a company! You know it by their great customer service, with nice people like Ashley, Pedego’s tech support is superb, and I can always count on Tim to answer my questions and solve my problems. 10,000 miles on my Comfort Cruiser and still going strong— thanks to the great folks at Pedego! I purchased a Pedego Cruiser on a whim in VA Beach. My wife and I had rented electric bikes a couple years back and I have wanted one ever since. I was immediately impressed by the polished and purposeful build of this bike. It just felt and looked like quality. Went back a month later and purchased one for my wife. We have enjoyed taking the bikes places and riding all over not worrying about hills but most of all for the simple fun of it. Well, on our way this weekend, our bike rack malfunctioned and my Pedego twisted out and dragged upside down on the handlebars with the rear wheel still strapped in behind a Chevy Suburban for a mile or two at 70+ mph before someone got my wife’s attention. I was expecting the worst but found that the ends of the handle bar was the only real casualty. The bike turned on and I rode just fine. I really expected it to be messed up and not ride right, perhaps vibrate etc. But, instead, the bike went as it was new. I called Pedego and they offered to replace the handle bar grips for free. Customer service like that just does not exist any more. My new Pedego Cruiser is a lot of fun and well worth the money...you do get what you paid for. Not only is the bike fun to ride, but the company stands behind its product. My local bike dealer fell through on part of the order for the new Pedego and did not fulfill their contract with me. 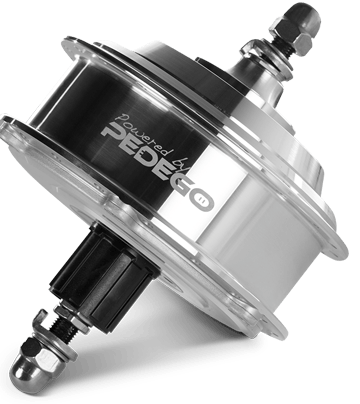 When I contacted Pedego directly, they were SUPER HELPFUL and fulfilled my order completely….and did it for free! They went out of there way to help me….you can’t ask for better customer service. I was impressed! I purchased comfort cruiser last year. It is a fun way to get around and am very pleased with this purchase. The battery recently stopped working and the customer service folks (Casey) was very helpful and I’m now back up and running. Pedego honored the warranty and sent a replacement battery out very quickly. I recently ordered my step-through cruiser and could not be happier with it. The entire process has been so easy and the people at Pedago are amazing and truly care about customer service. I had a 3 day weekend coming up and was told my bike would take about 10 days to get to me. I wanted it as quickly as possible but understood it would take some time. After talking with some people at Pedago, and to my surprise, my bike came within the week and I had it for my 3 day weekend. I took it out for its first cruise and had the best time and knew I made a great decision. I am 28 years old and love to ride my ‘regular’ bike for exercise, but now with this ebike, i’ll ride just about anywhere! I have a lot of hills by my house and never want to ride to friends houses when going over for dinner because I don’t want to arrive all sweaty and out of breath…now I don’t have to worry. I can exercise on my other bike when I want, and now I can cruise around town with ease with my ebike. So fun!!!! Thank you Pedago for making such a great bike and having such wonderful people! Our 2 Pedego Classic Cruisers arrived today and WOW… My wife had spinal surgery THIS WEEK and couldn’t resist a quick tour around the block… Well an HOUR later and we get back after doing about 10 miles and the wife feels great as the bike did all the work and was super comfy to ride. Riding an ordinary bike would have been impossible, but the Pedego allowed us to enjoy some much needed time out of the house. I am glad we upgraded to the Balloon package as the seats are super comfortable and the big fat tyres eat up the bumps. These bikes are a pleasure to ride and attract so much positive attention from the casually interested to the “Where can I buy one of those?” people who are instantly besotted. Great bikes for fun times. My wife bought me a Comfort Cruiser for my 60th birthday. Sixty-five in May…and we’re both still going strong (Me and the bike). My Pedego is my favorite thing! Seriously! I love my Pedego with all my might! I’m going on year 5 with my Comfort Cruiser and I can’t recommend Pedego enough! I ride… A LOT! I’ve been caught in rainstorms, blizzards and everything inbetween and my Pedego hasn’t let me down. I have a motorcycle and bicycle background and e-Bikes are right in the sweet spot for me. I ride it to work, to the park, to the lake, everywhere! If you can, buy one! 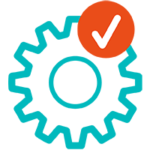 Not only are Pedego bikes built very solid but if you do have any issues Pedego coustmer service is AMAZING! It’s really hard to beat a company that just makes you feel good about owning their product. Any questions or small things I’ve come about have been resolved super fast and in a friendly and professional manner. Yes E-Bikes are expensive but you get what you pay for with Pedego! I’m 250lbs and ride year round, for almost 5 years and my comfort cruiser runs just like the day I got it! Perfect! I have gone through several tires but that’s to be expected with any bicycle and still beats having to buy gasoline any day. The only problem is not enough of my friends have one! Love love love my Pedego! I have had my Pedego Classic Cruiser for about a month now. The review I just read in this forum could have been written by me. I’m 53 and not in very good shape. I moved to downtown Houston about 3 months ago and found that walking to the office, stores, restraunts,the park, and just getting to know the town was wearing me out. Now I ride the bike everywhere. It is good exercise and great fun. I chose this bike because I’m big and I wanted an industrial strength bike. The Pedego has exceeded all my expectations. My hubby of 30 years surprised me this year with a Pedego Cruizer in my favorite color – purple with beige tires. This impressed me because he had been listening to me talk about wanting one ever since we rented them while on vacation in California last summer. He bought one for himself too! We have been riding them every chance we get. I cant say too much about what a wonderful present these are. My friends all want them now. Pedego bikes are smooth, fast, and fun to get around on. About 90% of my travels are on a Pedego cruiser. The battery provides more than enough for my daily rides. The brakes are awesome, and the overall performance is incredible. We have two and really enjoy using them. We get great mileage on a battery charge, and find then easy to peddle and operate. We do recommend these bikes for ease of use and comfort. We recently bought two Pedego Cruisers (one classic, one step thru). We have always ridden bikes, but in the past few years arthritis has prevented my wife from riding. Pedego changed that. Our Pedego’s have taken us all over San Francisco, Santa Cruz and bike trails around the Bay. We smile, we laugh, we hoot and holler. We are like a couple of 12 year olds. We are thinking of starting and Electric Bike Gang for group rides. Thanks Pedego, it’s been a pleasure doing business with you. Awesome Bikes, Great Staff, Fast Answers to questions, Flawless! I bought a Pedego 36v Cruiser about a year ago, And i have Loved every Minute of it! I get alot of looks when im cruising past Normal Bike Riders, Everything from Confused at why im flying by them (and not peddling 😉 Impressed to Flabberghasted! So fast! Even when its hot out the wind in my face makes it PERFECT! Finally an AWESOME electric Bike Company With LOCAL Dealers and AWESOME STAFF! If your looking for a Bike with Great people standing behind it Pedego is for you! So far a very good experience! Ive had my Comfort Cruiser for less than a week, but I ride it every day. Ive had experience with one other electric bike, and that probably just makes the Cruiser feel even better. Its solid and comfortable, and with the full balloon tire package must have a definite sedan feel. The motor handles hills and headwinds well, and gives you good power for quick starts in traffic. I havent had any problems with the bike, but customer service has found ways to be amazing already. This started with being helpful before I made my choice. So far a very good experience! Bought my Pedego Comfort Cruiser 9/11 and now have well over a 1,000 miles on it. The dependability and usability of my Pedego bike has gone beyond any other product I have ever owned. Best of all, Pedego support of their bikes makes sure of that. This bike is great for commuting to school or anywhere else! I got an electric blue beach cruiser for my 16th birthday and since then have used it for biking to school, which os on a hill, and geting around town. I love it because I dont have to worry about getting to sweaty when I bike wearing my backpack up the hill from school. I also can go much further that I would otherwise, and I love the electric motor when I am biking home late and am tired. The only bad part about the electrics is that it makes the bike very heavy and complicates going for rides with friends who dont have a motor. Another great quality about this bike is that it stands out for being so cute, which receives a lot of comments and gives me a chance to tell people about electric bikes. It is also very comfortable to ride and makes it possible to bike in a skirt! I bought a comfort cruiser in April of 2012. I needed a bike that met all the requirements for riding on bike trails in Orange County California so that I could use it to commute the 14.2 miles (one way) that I must to work. After accumulating 2000 miles on this great electric bike I can do nothing but recommend it strongly. There was about a month long period at the beginning where I needed to constantly tighten loosening spokes on the rear wheel as it “settled in” to the tremendous stress of my 195 lb weight and the torque that the 500 watt electric motor delivers to the rear wheel. Eventually one of the spokes broke. Now, 4 months later the rear wheel spokes never need any adjustment. Nothing else and I do mean nothing on this bike has broken or been a problem yet. The battery seems to keep it’s charge just as long as when it was new even after 2000 miles and the bike continues to run strong every day to work and back. This is a simple, fast, reliable bike and the folks at Pedego (I use the Huntington Beach Store) are fantastic. 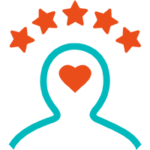 Great customer service is always available by their friendly, knowledgable staff. Buy a PEDEGO ….. you will love it. One of the best purchases my husband and I have ever made. My husband and I purchased our first Pedego Comfort Cruisers about 3 years ago. Since then we have upgraded to the Interceptors (my husband in April and me a month ago) and now my husband has put in his order for the new City Commuter. We love these bikes so much. This year I decided to finally do something about losing some weight. With a change in my diet and riding my Pedego I have lost 90 lbs. Many people accuse me of “cheating” by having an electric bike. In my opinion, I am not cheating. I pedal the entire time I am riding. I use the electric power to assist me in strong headwinds and up hills. We recommend Pedego to everyone. The company’s customer service is excellent- always available if you have any questions. Keep up the great work Pedego! My only suggestion is that you have a program if a family buys 5 bikes they get the 6th one for free. Ha! I can dream, can’t I? Hope to one day get to Irvine to visit their offices and take a tour of their facilities. LOVE my new Classic Comfort Cruiser! 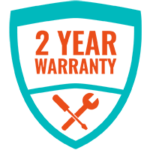 I’ve been a long time customer with Pedego Coronado location, and we are ALWAYS excited to get our bike serviced and look at new products, they are always helpful and friendly. My wife and I have been riding bicycles together for the past 40 years. However, a few years ago I had a knee replacement. Along with the rehab, we continued to ride bikes. Over time I would be slower and slower, so my wife would be riding circles around me. Finally I rented an electric bike and realized that the Pedego would be the answer for my future bicycle enjoyment. We can ride now together, and she can get the great workout that she likes, and I can enjoy the smaller workout along with the fresh air and sunshine. I purchased my Pedego shortly after I took a new job in a neighboring beach town. I live a mile from the beach in SoCal, and my office is accessible by a bike path that I can cruise on for 12 miles of pure ocean bliss with my Pedego. I show up to work and get prime parking every morning. It’s more than paid itself in gas saving money and the ride is 100x more fun along the ocean vs sitting in smoggy traffic! I also take my bike down to San Diego every year for an annual electric bike crawl with my about 30 friends! It was the best purchase I could have made. Being 80 years old living in a retirement community and getting exercise is a must. Walking is great, but a bike expands your horizons and is terrific. Biking regularly you can go too far with hills and wind, the Pedego gets you home without any effort. Beautiful Bike That Gives a Wonderful Ride!! I was in my 60’s when I purchased my Pedego in 2016 in California. I saw it as a way to get out in the fresh air and get my muscles and legs moving after work and on weekends. In September 2018, I retired to SW Florida. I now have over 3,600 miles on my bike and have ENJOYED every mile. No other bike like it!! I’m 68 years old and have enjoyed the outdoors my whole life. A good friend of mine had a heart attack and his doctor recommended taking up cycling to lose weight. He went through several conventional bikes before he purchased a Pedego which instantly became his favorite bike. I have always loved riding bikes and was very intrigued. I eventually went to the same Pedego dealer and purchased one but not before testing out every other electric bike option. I know my friend is very particular but I had to justify spending $3-4K on a bike. Here’s my justification. I ride 2-3 times as much, go 2-3 times as far, have 2-3 times as much fun, hurt 2-3 times less after extended rides, have 2-3 times less fear of becoming exhausted on a trail, have zero fear of hills and have 2-3 times as many people ask me about my cool bike so why wouldn’t I pay 2-3 times more than I would for a regular bike. I have owned a Pedego Comfort Cruiser since 2012 and it is probably one of the best purchases that I’ve ever made. Since getting the bike, I’ve lost more than 30 pounds and have kept them off. I like the comfort cruiser for its simplicity (turn the throttle and go) and being able to sit upright, without putting pressure on my sholders from having to lean on the handle bars. Pedego’s customer service has been wonderful. If you are considering an electric bike, buying a Pedego is an investment in your future. If biking is more fun, you will do it more often, and you will feel better for it. The Comfort Cruiser is easier to get on or off than a regular bike which is great for older riders. In addition the battery gives me the freedom to roam farther from home knowing I can get home on power if needed or give a little boost while pedaling to make hills or into wind easier. I’ve had my Pedego over 5 years, and I can honestly say I have not grown tired of it. My husband got one first, and I had to get one to keep up with him while biking. I can go anywhere with it. I have a bad knee and a bad hip, but I can still Pedego! We have rented them on vacation in Monterey, CA, and in Maui! So much fun! And we have traveled with our own bikes to lots of fun places. A favorite place to ride is on Angel Island in the SF Bay. Pedegos give you the ability to ride almost anywhere. To enjoy the fresh air and scenery and exercise. I’m looking forward to many more adventures on my Pedego, and on rented ones! I don’t think there is a better word to describe the Pedego experience than fun. I have had my Comfort Cruiser since July 2017. I have rode 8495 miles. I just go out and cruise around and go here and there not worrying if there is a hill, or long incline. I use it for almost everything shopping going to the doctor. I almost never take the care around town. The comfort level is so much more than a conventional bike. People just love the color and look of the bike and I frequently have pedestrians yelling “Nice bike”. The service at the La Quinta Pedego couldn’t be better. All in all you are crazy if you don’t buy one. My husband an I purchased our bikes a year and one-half ago. His was fitted so both pedals were the same height due to his arthritis causing physical limitations. He can use the bike without making the revolution. After his second knee replacement we can have this reversed. I ride my bike all the time and see why they say Hello Fun! The bike is very comfortable and sturdy. Glad we made the purchases! I should have bought a Pedego a long time ago. I LOVE this bike! Often my mind is willing to ride but my knees aren’t and the assisted pedal feature is wonderful! I have a basket on the front of mine for my 8 lb Shih-Tzu pup. She also loves the bike. She wants to ride with me every time I go out so now I have to spell out where I am going on my bike to my husband so that I can ride by myself as she knows the word “bike” and thinks she has to go too. Previously I was riding maybe a couple times per week but now I ride every day!!!! I wasn’t going to buy this electric bike,I own 2 pedal bikes and fast cars.I went for a test ride because my son wanted one.He was hurt in the desert storm war,and his legs hurt.So I went with him and we got on the test bikes.I flew passed him and I told my son,I’m buying this and he bought one also.We have had a lot of fun,and looking for more fast fun,as soon as the wheather breaks.My son loves his bike,it gets him out of the house,we can stop wherever,and he is not hurting by pedaling. These bikes are sturdy,and we both feel really comfortable on them. I fell in love with my Pedigo from my first ride. I tried other models but the commuter was the right bike for me. I’m an older rider and my home is in the hills near Santa Cruz, CA, so I need a bike that I can ride all day at the beach but that can get me back up the hill at the end of the day….my Pedigo mid drive Commuter does it in style. I got so confident in the bike’s reliabiliy that I took it with me on my RV to the Northwest last summer, and got to ride all the way around San Juan Island with all the young folks. Happiness is a Pedigo. I’ve had my Pedego for about 8 months now and love the additional range it gives me for biking – I live in the suburbs and am able to ride 10+ miles into neighboring cities and still feel refreshed enough to do light shopping, grab a bite to eat, or see what’s new. I’ve even used it to replace one of our family cars – we’ve got a minivan for the kids, but I work from home most of the time, so the Pedego has been a great way to still let me get to coffee shops and other destinations without having to carry a car payment and insurance. Overall, I think the build quality is great and the power of the motor makes hills a breeze – I can’t wait for this Indiana winter to be over so I can get back out there and ride some more! 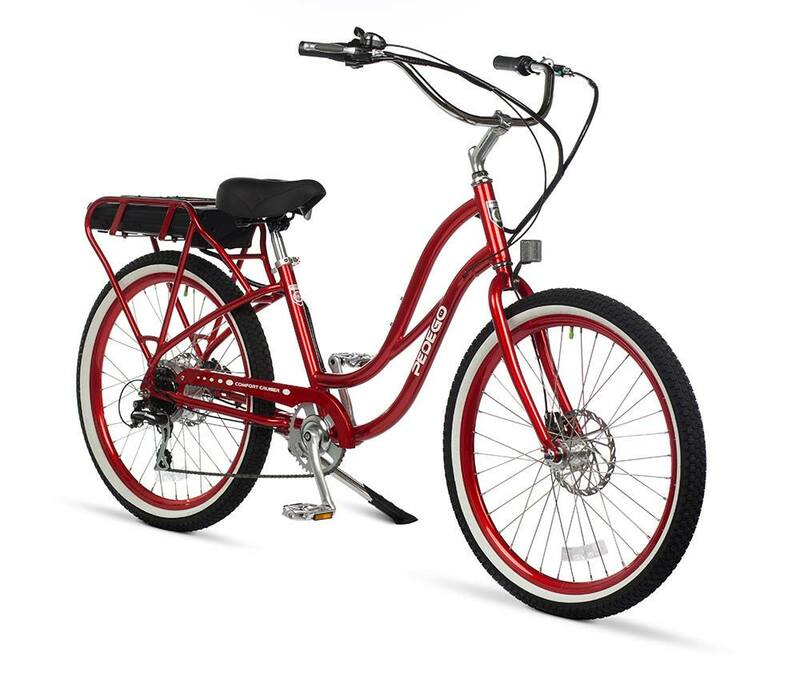 Hello my fellow Pedego bikers, I would like to express my great enthusiasm towards my purchase in 2012 of my wonderful cherry apple red pedego! This bike gave me the ability to rehabilitate myself after back surgery. And it is my joy still in my life! I love my Pedigo it has been the best investment for myself I’ve made in a long time. I can walk after riding now, my hands and back do not hurt afterwards either. I can ride up hills in no pain, I can’t say enough, I LOVE it! Come on enjoy yourself go riding! I tried an electric bike for the first time in Italy on a tour of the Apian way. I was only 4 months post op on a total knee replacement. One mile down the road and I knew I had to get one for home! That Christmas, my husband got me a Pedego because of talking to the dealer, Pedego Junction, he felt it was a good investment. I am in love with this bike! Everyone smiles at me because I am totally smiling every minute of my ride! People ask about it and tell me how beautiful it is! I enjoy everything about my PEDEGO! I spent alot of time reviewing all electric bikes, and settled on Pedego because of the people and service available near me! My bike is extremly comfortable, easy to ride, holds a charge well, and looks great!